The streets beneath our feet are getting smart. Angela Saini investigates a movement called Shared Space, which promises to dramatically change the way cities look and feel. The streets beneath our feet are getting smart. Pavements are melting into the roads and traffic lights are disappearing. Inspired by the work of scientists and engineers in Holland and Japan, this is a revolution in urban design. Part of it is a movement known as 'Shared Space', which promises to dramatically change the way cities look and how we experience them. In Thinking Streets, Angela Saini asks if all these ideas really fulfil the promise of making us all safer, happier and more efficient? Two years ago, at the heart of London's shopping district, a strange thing happened. The big red buses, white vans and black taxis that usually skimmed pedestrians as they tried to beat the maddeningly slow grid of traffic lights at Oxford Circus, were stone still for thirty seconds. And suddenly every person standing at the junction scrambled into the middle of the road. In one stroke, life changed for the 90 million people who step through Oxford Circus every year. Not only has it made life easier for those on foot by giving them 70% more space, it's also faster and looks neater. In 2010, the council even claimed that it contributed to a 7% rise in annual sales in the area's shops. 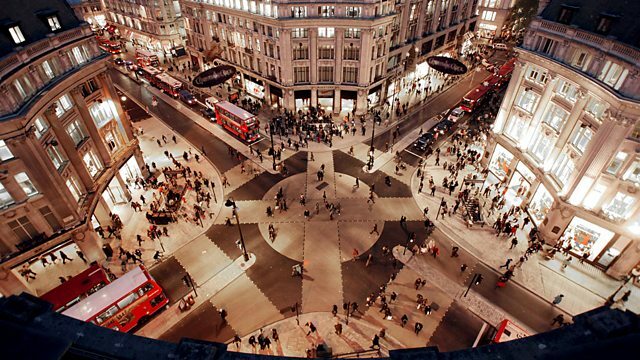 The Oxford Circus diagonal crossing was one of the first steps in a growing movement to change streets in Britain and all over the world. Today, engineers at Imperial College London are helping to overhaul South Kensington's museum district, with pavements being levelled down to the same height as the road and new criss-cross paving patterns designed to calm drivers (the scheme is nearly complete and the result is striking if rather disconcerting). In Portishead, near Bristol, a trial that removed traffic lights from a notoriously congested crossing was such a success there are plans to roll it out across the town. Other schemes already constructed include Brighton's New Road and another in Ashford, Kent. But Shared Space has been labelled 'speed-bump science' by its critics - Jeremy Clarkson among them. True, one of the guiding principles is reducing traffic speed, often with the use of raised brick-paved areas (very long speed-bumps!) but proponents insist Shared Space is a creative and radical solution aimed at improving the experience of all road users. And the benefits go beyond reduced accident rates to a host of socio-economic benefits for the cities, towns and villages choosing to adopt such schemes. In practical terms, a shared space scheme will involve removing the distinction between streets and pavements. No barriers, few if any road markings, no pedestrian crossings, and little in the way of street signage. The result of this street minimalism is that you enter a shared space very much at your own risk. And this is the key to improving safety, traffic flow and quality of experience. The early roots of this innovative concept lies in the work of the late Dutch traffic engineer, Hans Monderman. A passionate advocate of shared space, Monderman and colleagues started small - more than twenty years ago, converted an intersection in the northern Dutch province of Friesland from a conventional signal-controlled intersection to a brick-paved street, giving equal priority to cars, people and cycles. The idea was that people would use their own minds in navigating the streets, building their own informal traffic rules. Research has shown that these kinds of shared spaces automatically reduced traffic speed to under 20 mph - the threshold at which the chances of being severely injured in a road accident plummets. This highly counterintuitive approach - increasing risk decreases accidents is finding favour (albeit slowly and not without opposition) all over the world. Today, Monderman's vision can be experienced throughout his Dutch province of Friesland, no where more so than in Drachten, an unassuming town that until recently was famous only for being the home of the Dutch electronics giant Philips. As Angela discovers for herself, Drachten's shared space schemes (and those of its near neighbours) now attracts a regular pilgrimage of engineers and planners, from all parts of the world, eager to experience this new urban vision.